There are different trading methods for Chinese businesses (B2B) and Chinese consumers (B2C) within both China and in your local market either over the internet or visitors from China. Before you start please look at your business and product / service branding in China. If your business branding is not registered in China, we recommended you correct this ASAP. All your Chinese marketing can be undermined by another company; either Chinese or overseas, by registering your business brand(s) in China and reproducing your products /services locally. In addition, if you are selling goods inside China your product(s) may require local certification, e.g. power supplier need CCC certification. While it the responsibility of the Chinese importer to check and apply for any required certificate it may be appropriate for your business to be part of the certification process so that you have ownership of the final documentation. Generally, this does not apply to products purchased from outside China and posted to a consumer in China. The major expectation to this rule is power rating; China voltage is 220V/50HZ. This is different to the many countries, including UK, EU, USA. There are many Chinese citizens visiting and been educational world-wide. This is normally where an interest in your locally marketed starts. People visiting your local market can see your products in the context of use, look and feel. Often this will be shared on Chinese social media and interest can grow. Chinese people like purchasing from overseas suppliers as they feel the quality is better and the branding is genuine. Developing business relationships with Chinese social media users with large followers will greatly help with sales in your local market. 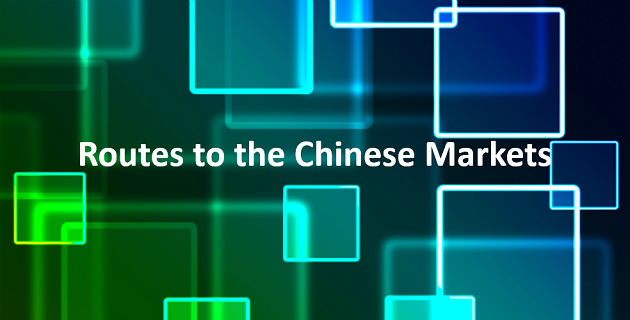 Engage with your local Chinese customers and supply them with your internet contents links. Allow pictures to be taken. If you have your brand registered in China, you are protected long term. Some products require a view / demonstration helps understanding; an internet media presence is critical e.g. video, on line brochure, CGI (computer-generated imagery), etc. hosted where the Chinese market can see it in China. Therefore, Access to China is developing WiTravel and B2B66 in mainland China. Taking your product information into the heart of China. Internet presence locally and accessibility presence in China with a few words in Chinese introducing your business and key products / services. The big advantage in this approach is you are looking for the Chinese market connections in your local market / country. This is very cost-effective method of doing business and is often support successfully by local government and national trade organisation. Proactivity marketing / selling to the Chinese market in China. You still not need to visit China at this stage. The internet enables you to do much of the early stage work without leaving your office. New overseas channels: b2b66 project. This is the simple method of trading with Chinese market as it is the importers responsibility to make sure all the Chinese rules and regulations are followed. A Chinese agent becomes your local agent in Chinese markets. Often if you have services or products that maybe of interest to the Chinese market a local Chinese agent will approach your business. Agents looking to make large returns on a few simple transactions normally only have a few contacts within the Chinese market. You should not you appoint an agent for the whole of China or a region / market. Termination / cancellation agreement if the targets are not achieved. This agreement should be performance based over an agreed period. Make sure that agent agreement allows, where appropriate, for B2C selling to continue in the Chinese e-Malls. The agreement should allow Chinese customers to still directly approach your business. Many Chinese business will not do business with a Chinese local agent. This will also apply to overseas companies wishing to use your product / services in China. While this will need agreeing with the Chinese agent., you do want to close any distribution channels at the outset. While all the above points apply to a Chinese agent, a Chinese distributor will handle your goods. This will include importing, storage, local shipping, returns, servicing and repair, bookkeeping, payment etc. Our recommendation is that all goods sent to China must to paid for before they arrive in China. If this is not the case, your business, at best, will be indirectly for running the distribution channel, i.e. if distribution channel is not successful you will not be paid. Chinese businesses generally do not hold stock. Most goods are made and shipped to order. The exception is a wholesaler. This only works if there is ongoing demand for your products. Spare parts and consumables maybe an exception to holding stock locally in China. We recommend an ongoing shipping relationship could include spare parts and consumables as part of the overall purchase from the outset. If this can be achieved, your business should not be responsible for stock in China. To help in your relationship with potential Chinese distributors investigate the use of faster shipping methods to China; flying, train, etc. Reducing the leads time to China will help all parties manage order stock levels and working capital. A local Chinese office is where a potential Chinese customer can make contact. The local office must have a good knowledge of your products / services or at best an understanding of your market. This is good place to start if you are not planning your own business presence in China. It’s supplies a local contact for business in the local time zone, local language support, etc. A local office can also run local market campaigns, help desk, first line sales support, etc. It is normally a cost-effective way to start a presence in China. Many of the country trade organisations support local office representation as well as local trade organisations. Licensing your products or services to a Chinese business can be a cost-effective way into the Chinese market. Many businesses over many years have been very success with this approach. The key to success is protecting your business interest: Branding, patent, software, etc. When protecting your business interest please make sure it is your company name on any Chinese branding certification, etc, and not the Chinese business you are working with. The same points apply to local licensing as with local Chinese agents. The key points being; make sure any agreement is performance related, license by Chinese region / city. In China a JV normally involves creating a Chinese business which has all parties funding and running the business. This was very popular way for a business to establish an overseas company in China. Today, given that setting up an overseas company (WFORE) in China is a lot more straight forward, there are lot less reason to create JV today. A JV applying for Chinese government funding. The local / national government can support Chinese business and JV in funding needs. Local licensing and trading agreements that are not issued to overseas companies e.g. internet ISP agreement. Large Chinese and overseas businesses were both businesses have a track record of success. Like with many of these trading structures where your business is investing in China, the controls of business and management of funding in very hand to achieve. We would recommend that the agreement between businesses has clear responsibilities and should be run as a project until JV is making a return. Creating your own business in China is a lot more straightforward than in past. It creating a Chinese business you are making an investment in China. This, along with JV, is the most costly both in funding and business executive time. We do not recommend not doing this until your business has considered and tried some of the other options above. For more information about creating a business in China, please see Creating a Chinese Business.